Dr. Robert A. Glover holds a PhD in marriage and family therapy and is himself a recovering Nice Guy. 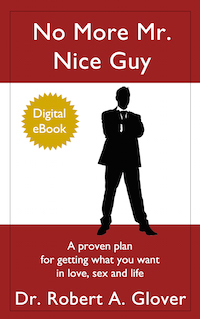 As a result of over 30 years of clinical work with countless men and women, Dr. Glover has become widely recognized as a leading authority on the Nice Guy Syndrome. Dr. Glover lives in Puerto Vallarta, Mexico, where he writes and leads workshops and seminars for men. His website drglover.com features numerous online courses focusing on personal growth, relationships, sexuality, and career.